Calligraphy: A Book of Contemporary Inspiration is not your usual book on calligraphy or lettering. Instead, it's an artbook inspired by the lines and strokes created by the calligraphy pen. I'm currently interested in learning calligraphy and upon flipping just a few pages of the book, I knew I had to buy it. It seems that there are two editions for the book. The hardcover is originally published in 2009 while in the paperback edition is released in 2014. The book is written by Denise Lach, a teacher who teaches lettering, design and screenprinting. 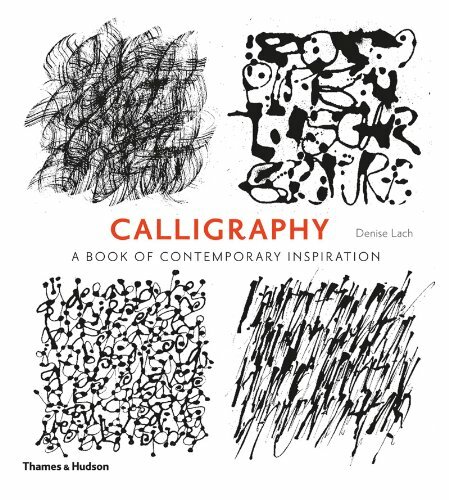 This book features beautiful calligraphy inspired artworks. The highlight is the use of the calligraphy pen to recreate the patterns from real life into artworks. For example, it can be using the broad strokes of the nib to draw out letters that resemble the silhouette of a walnut. using repeating letters to recreate textures from nature such as sand, granite rocks, veins of leaves, spikes of cactus, woodgrain and more. Content is split into chapters featuring specific tools, such as nibs, ruling pen, Cola pen, pipettes and a combination of tools. Sometimes when you look closely, you will find that the textural artworks are made up of letters, but sometimes they are just many strokes and ink blobs beautifully woven together to form some sort of image, art. There are lots of beautiful examples in this 192-page book. It's quite an inspiring and creative book. Highly recommended to those who like calligraphy and contemporary illustrations.